If you have received arrears of salary/pension in Financial year 2017-18 related to previous year(s) then your tax liability will be on higher side due to arrears but do you know that you can bifurcate your income from arrears in respective years on notional basis and can avail relief u/s 89(1) of Income tax Act ,1961. We have prepared a small excel calculator which will be helpful in calculate the relief under 89(1) for arrears received in financial year 2017-18 and arrears relates maximum older up to financial year 2005-06. This calculator can be used on-line or can also be downloaded for offline use. This calculator show two calculation of Income Tax ,one is Tax on the basis of the receipt of salary/arrears and other is Tax on the due basis of relevant years and if tax on receipt basis is more than due relevant years basis then relief under section 89(1) will be available otherwise nothing is available means no benefit in distributing the arrears in respective years. You have to fill only yellow column only . (For online version-After each entry an updating sign will be shown,after disappearance of the sign only then enter next data. ).If arrears is related to few year than years provided in the sheet, fill zero in other non required years. Fill Total Income excluding arrears ,including all other income and after all the deduction like section 80C,80CC,80D,80G ...........80U etc. Fill year wise break up of arrears received in financial year 2017-18 under respective years.Total will automatically shown under FY 2017-18 . Arrears column(C-12 of calculation sheet) under Fy 2017-18 is protected and can not be edited ,If you have received arrears related to Fy 2017-18 in Fy 2017-18 it self then it is not covered under the definition of arrears and to be included in total income of Fy 2017-18(C-11 of the calculation sheet). Long term capital gain calculation is not covered in this calculator.So if you have LTCG in any of the previous year for which calculation is required then this calculator will not help you. Income tax on special rates like tax on Short term capital gain on equity shares /securities is also not covered under this calculator. If any question /query then asked in comment section. To download the calculator ,share this post on Facebook/Twitter/Google+ and click link from your Facebook/twitter/Google+ page ,Lock will be opened automatically. 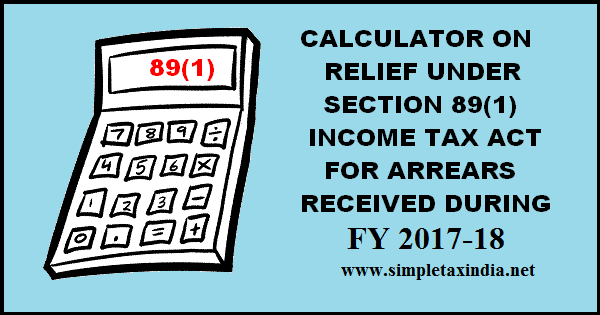 If are not able to download the calculator,then download from page-2 directly or mail us a request at raniraj1950 at gmail.com with subject " 89(1) relief calculator Fy 2017-18"
Following employer may allow benefit u/s 89(1) if claimed by employee. In this case consider your salary as no arrears has been paid /recovered. And claim refund of tds. Hello we are unable to download the calculator even after doing the steps above. PLease if you may share the latest copy of this calculator on aaa13121983@gmail.com will be helpful.